Although one should never judge a dinner from the appetizers, the numbers coming from the Estrellas Poker Tour (ESPT) are already exciting those keeping an eye on the Barcelona Poker Festival. In fact, many are expecting the event — the 100th EPT event in history — to produce the largest EPT Main Event ever held outside of the PokerStars Caribbean Adventure. 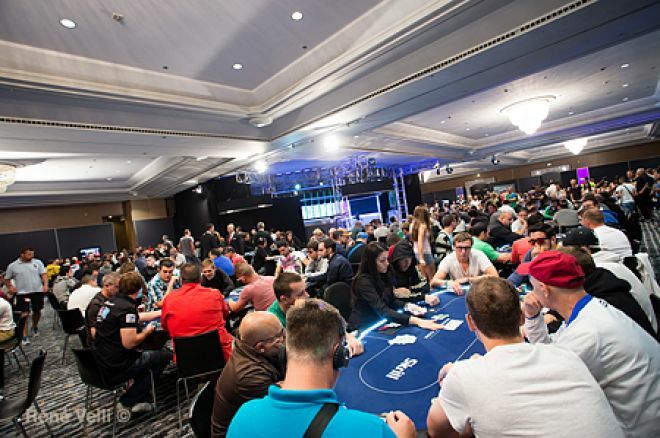 After only two of the three Day 1s of the ESPT Main Event that precedes the EPT Main Event, the tournament has already attracted the biggest-ever unique field in the history of PokerStars live events. And there's still one more starting flight to go. Day 1a brought 438 entries to the table and Day 1b attracted another 872 entries. With well over 1,000 players already signed up for Day 1c, the total field size thus far has pushed well past the 2,300 mark and is more than 200 greater than the Brazilian Series of Poker (BSOP) event organized by PokerStars in Sao Paulo in October 2013. With such significant numbers, the ESPT Main Event confirms the love that the poker community has for Barcelona. During 2013, the same event managed to set a record thanks to a 1,798-entry field (then broken by the BSOP, the Beijing Millions, and this year's event). The opening event of the poker festival organized to celebrate the beginning of the European Poker Tour Season 11 and the 100th stop of the EPT circuit, attracted an outstanding international field of players who came to the capital of Catalonia and enjoy the combination of great poker and fun events organized by PokerStars in a superb location like Barcelona. Among the most famous faces that have decided to show up at the ESPT Main Event and get a chance to start the festival with a good run, Spain's Tomeu Gomila, Juan Manuel Pastor and Patxi Salinas found their place at the tables together with international stars of the game as Britain's Jake Cody, France's Bertrand "ElkY" Grospellier, Ukraine's Eugene Katchalov and Italy's Andrea Benelli. As play heads to Day 1c, the top of the chip lead is firmly in the hands on Spain's Marcos Fernández, who has managed to bag 239,000 in chips at the end of a Day 1b. Follow the €50,000 Super High Roller on PokerNews! Day 1c of the ESPT Main Event action is set to start on Monday, but that's not the only big action that will be happening. Monday also marks the start of one of the festival's most awaited events, the €50,000 Super High Roller. With over 30 players already confirmed and a field that includes last season's runner-up Erik Seidel, Team PokerStars Pros Daniel Negreanu, Vanessa Selbst, and Jason Mercier, and the winner of the World Series of Poker Big One for One Drop, Daniel Coleman, the Super High Roller is sure to offer some top poker action. Players in the event will battle against each other to get their hands on the massive title that one year ago went to Russia's Vitaly Lunkin. He took home a €771,300 first prize after he beat a 51-entry field. If you want to follow the action at Barcelona Casino, don't miss PokerNews'live blog of the Super High Roller event!